The Raspberry Pi low power PC is a single-board computer developed by the British Raspberry Pi nonprofit foundation. Its main purpose is to serve as an instructional and teaching device for education settings such as classrooms. Its extremely small form factor and low power consumption, coupled with the extremely low prices for which it is offered ($25 to $35 per unit). As a point of reference, the Raspberry Pi computer system (both models A and B are in the identical form factor) is about the same size as a deck of standard playing cards. Both of the low power PCs share the same 700 MHZ ARM processor and Broadcom VideoCoreIV graphics processor, as well as 256 megabytes of SD RAM, the Model B has 2 USB ports while the Model A has only 1. Additionally, the Model A has no RJ45 Ethernet port, while the model B has an integrated Ethernet port. The power usage for both models of the Raspberry Pi low power PC is astonishingly low. The Model A uses only 500mA, or 2.5 Watts, compared to the Model B, which uses only 700mA or 3.5 Watts. Incredibly these two PCs can both be run on 4 x AA batteries. This isn’t to say that the Rasbperry Pi is a midget computer or is hobbled in any way. Although it’s not blazingly fast, the Raspberry Pi foundation has released a distribution of the Fedora Linux operating system designed specifically for the system. 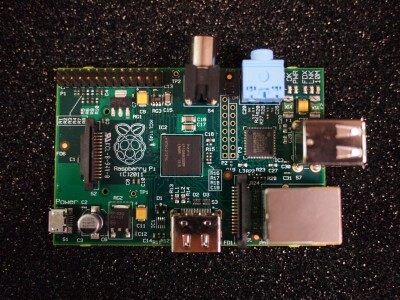 With Fedora, the Raspberry Pi will be able to browse the internet and play HDMI video. The Raspberry Pi has been demonstrated playing Full HD Mpeg-4 video through its built-in HDMI output, making it capable of being used as a home media center with the proper storage. Developers are planning a port of the XMBC digital media center, a Linux-based digital media center operating system. By reducing the size of the device and its power consumption, the environmental impact created by its production and use are limited to the greatest extent possible when utilizing a standalone desktop PC. Because fewer materials are used to produce the small device, the waste generated by the production of those materials and the power used in the production process is significantly reduced compared to the production of standard-sized desktop PCs. The tiny size of the PC also allows it to be installed into a variety of cases. The reduced power consumption also helps the environment by reducing the amount of power taken off the grid to power the device. Many standard desktop computers require more than 100 times the power of the 3.5 Watt model A’s usage. Less power consumption means less fuel used in power plants and less greenhouse gasses pumped into the atmosphere by power plants. The incredible price of this low power pc will allow it to be massively manufactured and distributed to developing countries and other impoverished areas. The cheap and accessible PC will help stimulate interest in computer science courses among students. Since the Raspberry Pi is a single-board computer, all the components of the device are integrated into the main circuit board. No other external devices or peripherals are needed for the computer to run. Since it is being developed by a charitable organization registered with the Charity Comission for England and Wales, any money taken in by the device’s creators will be used to fund further iterations of the device, help subsidize device costs for the needy, and to pay for components.